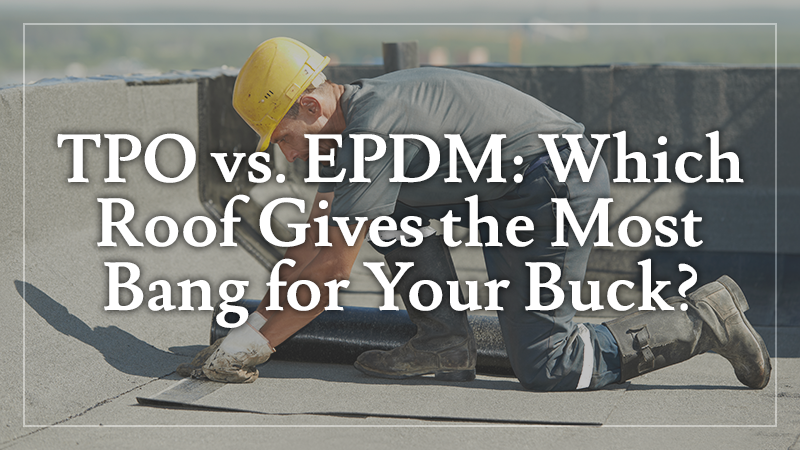 TPO vs. EPDM: Which Roof Gives the Most Bang for Your Buck? Deciding between TPO and EPDM flat roofing can be challenging as both products are high quality and durable. The primary difference in value comes from how your building will be used, what type of weather challenges it will endure, and how frequently you’ll need to access the roof. Understanding how these two roofing materials differ from one another can help you determine which is the best option for your project. 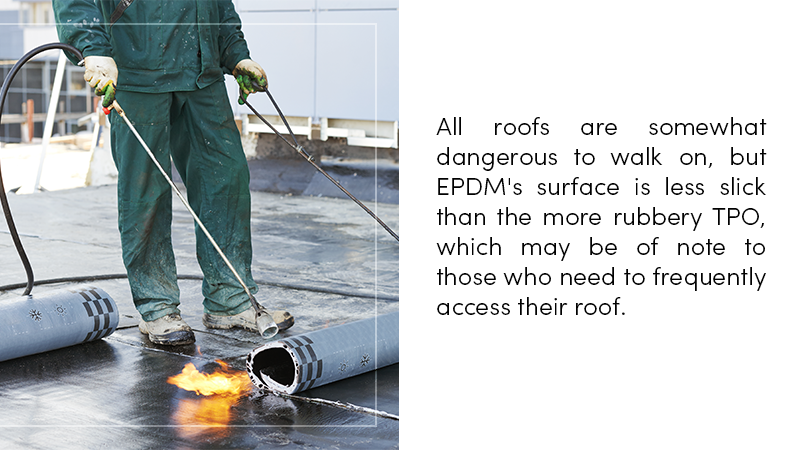 EPDM provides a less slippery surface than TPO does. All roofs are somewhat dangerous to walk on, but EPDM’s surface is less slick than the more rubbery TPO, which may be of note to those who need to frequently access their roof. The black surface also absorbs heat in the daytime, which may be useful for those building or remodeling roofs in cooler climates. TPO is much better at handling chemical resistance than EPDM roofing, which can be significant or unimportant depending on the environment and use of the building. The material is generally white, though larger roofs have a wider range of color options. The manufacturer also offers a wide range of prefabricated accessories, for notable design flexibility. The lighter color reflects heat rather than absorbing it like EPDM does and thus stays cooler, making it a better choice for warmer climates. Because the cooler environment is less challenging for HVAC units, it makes environmental sense as well, reducing energy consumption and with it, operating costs. What are the Downsides to TPO and EPDM Roofs? Seam welding uses 3-inch or 6-inch tape and liquid sealant, which can come apart with time and require replacement. Grease and some chemicals can damage EPDM roofing, which may not be a concern for some types of buildings. For others, the building’s intended use may significantly reduce the lifespan of the material. The black color absorbs heat and can create a hot environment. This can negatively impact the operation of HVAC systems and other rooftop equipment, particularly in Tennessee summers. Highly slippery, increasing the danger of rooftop movement. Not necessarily the best option for anyone who wants to do the install themselves as the seam welding needs an experienced hand for the best durability. Shorter life span compared to EPDM, providing only 30 years to their 40. The answer to which flat roofing system will best suit a project lies in the details of the project. An experienced contractor will help you navigate your choice. Contact L & L Contractors for a free inspection and assessment of which roofing system is right for your commercial or residential project. L & L Contractors has earned a solid reputation in middle Tennessee for offering stellar service from start to finish and can help you get the most value out of your roofing budget, whether you are tackling a new build or navigating a complex insurance claim.